Seung Hwan Oh had 19 saves in his first season in St. Louis. JUPITER, Fla. (AP) — Tyler Lyons recalls being impressed. Then he wasn’t so sure. Then, well, pretty much everyone realized what the Cardinals had in Seung Hwan Oh. A year ago, Lyons was admiring how his new bullpen mate was able to work the corners of the plate with an array of pitches. A couple weeks later, Lyons was concerned when Oh’s fastball ticked only the high 80-mph range during early spring games. “And you get to the (regular-season) games, and it’s season time, and he’s throwing sliders harder than he was throwing fastballs in some of his first spring outings,” Lyons said. Even Cardinals management wasn’t exactly sure where Oh fit. St. Louis signed Oh, who earned the nickname “Final Boss” as he grew into one of the best closers in Korean baseball history, after his contract with Japan’s Hanshin Tigers expired following the 2015 season. A closer nearly all his career, the right-hander’s role with Cardinals entering his first Major League Baseball season wasn’t defined. 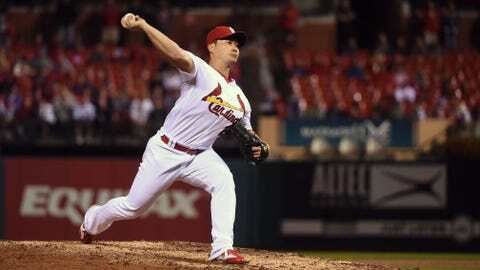 Trevor Rosenthal saved a combined 93 games over the previous two seasons for St. Louis, but he battled control issues and injury, opening a spot for Oh. The South Korean threw strikes, which translated into outs, and ultimately saves — 19 of them. Cardinals pitchers and catchers officially reported to camp Monday but Oh, like most of the players in that group, has actually been here for a little while. Last spring, he arrived a couple days before reporting date. This time? He’s already been in Jupiter for about a month. Other than the earlier arrival, the 34-year-old Oh didn’t alter much from previous offseason routines. “I just have a better grasp of things to manage myself time-wise,” Oh said. He’s feeling a little bit stronger this year, too, but that won’t change Oh’s approach to the spring. Grapefruit League hitters can expect spring fastballs that resemble regular-season change-ups — especially early. The one major difference in this year’s spring routine will come when Oh returns home to play for South Korea in the World Baseball Classic — one of six Cardinals big leaguers who will take part in the tournament. It will be Oh’s fourth World Baseball Classic. In nine WBC appearances, Oh has posted an 0-1 record with two saves to go with a 2.78 ERA. Stores in South Korea are already selling out of St. Louis Cardinals hats, said interpreter Eugene Koo, who attended events there with Oh in the offseason. During that return home, Oh drew throngs for autograph sessions, embracing the fame that comes with being an international star. “It’s not bad, because it also means that a lot of Koreans are getting more interested in Major League Baseball and they are watching more of the sport, so it’s a good thing for us,” Oh said. That’s the future, though. At the moment, standing near Florida palm trees, Oh’s mind is on the Cardinals. “It starts now,” he said.